Last match of the season and the sun still shining. A close fought Middle England League match at Kingsthorpe BC, up by 6 shots at 10 ends, then down by 5 at 18 ends, pulling back to lose by just 2 shots. Oxon ladies beat Hants in friendly. 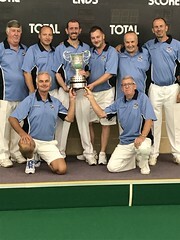 Bowls Oxfordshire ladies beat Hampshire in a friendly played at Witney Town BC on Wednesday 22nd August, penultimate game of the season, a win on all rinks. The rearranged 2nd day of the ladies county finals was able to go ahead on Saturday at Oxford City and County. A complete change of pace due to the weather going from rain and green heavy to glorious sunshine and quick swinging green. 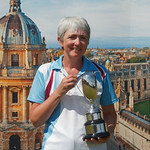 Caroline Campion (Banbury Central) took the much coveted ladies singles title after defeating Karen Galloway (Oxford City & County). The pace seem to catch Campion out to begin with as Galloway settled quicker on her home green. Galloway started strong going 8 – 2 up. Campion, who has been in fantastic form all summer, fought back to level the score at 10 – 10. After that Galloway couldn’t do much to halt Campion who forged ahead to take the title 21 – 13. 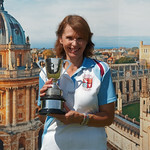 Carole Galletly (Banbury Central) won the 2 wood singles title after beating Katherine Hawes (Oxford City & County). Galletly found the pace quickly racing to an 8 – 2 lead over Hawes. The following ends saw an exchange of winning ends with the score standing at 11 – 7 to Galletly. Galletly looked certain to take the title after winning a string of ends to take her score to 15 – 8 ahead but Hawes never gives up and fought back winning all of the remaining 4 ends but didn’t manage to score the 2 she needed to take the game to a draw. Galletly was victorious with a score of 15 – 14. 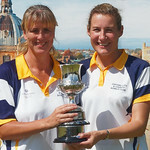 The pairs final saw Galletly and Campion team up to face Hawes and pairs partner Donna Knight. The game was very close throughout with the scoring kept to one or two shots per end. Knight and Hawes managed to push themselves further out in front on the 11th end to bring the score to 10 – 6. Knight and Hawes keptthe lead to around 4 shots ahead until the 17th end where Galletly and Campion picked up a 2 to reduce the City & County pair’s lead to just 2 shots. The teams traded ends until the 20th where Knight and Hawes picked up a 2 to push 4 shots ahead again. On the final end, Campion killed the end not being able to make up the shots they needed but the replayed end saw them just pick up 1 shot for the score to finish 16 – 13 to Hawes and Knight.